Antique, Jacob Zeidler & Co. - Porzellan Fabrik-Bavaria Hand Painted China Tea Set - "Gold Blush" - Made in Germany from 1866 though 1889 - Totaling (34) Pieces. 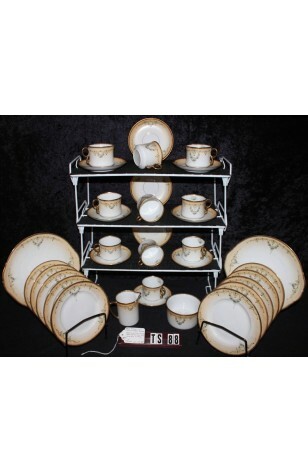 This beautiful Antique, Hand Painted Set of Bavarian China is a Service for Ten. Being Produced sometime between 1866 and 1889, this Bone China Set is still at its best. The Colourway of this Pattern is called "Golden Blush" for its Cream China with a Blush of Gold on the Lip. Holding Green Swags of Purple Flowers. Bright Golden Rims on All Pieces. Golden Ring Handles on Cups, with a Portion of the Pattern on the inside of the Cup as well. Very Thin.